Premature babies often need special care in the neonatal unit at Christchurch Women's Hospital. Exactly how long depends on how premature they are and what medical problems they have. What early problems can premature babies have? Premature babies usually take a while to feed well enough on their own. This depends on how early they were born. They may need extra feeding, with either your breast milk, pasteurised donor breast milk, or formula milk. They get this extra feeding through a tube that goes from their nose to their stomach (a nasogastric tube). Breast milk is the best food for babies, especially premature ones, but sometimes it can take a while for a mother's milk supply to start if her baby is premature. The neonatal unit has a Human Donor Milk Bank to help babies who need extra milk. Younger babies can have problems with breathing, because their lungs are immature, and so may need to be placed on a ventilator to help them breathe, until they can breathe normally on their own. Because premature babies have very little fat on them, they can get cold very quickly and struggle to stay a constant temperature. This is why they need to be in an incubator or in skin to skin contact with mum or dad. Then they don't have to use their energy for keeping warm instead of growing. Skin to skin contact has many benefits. They also struggle to control their blood sugar levels. If their blood sugar gets low it can cause seizures, so they need frequent testing (usually done with a heel prick) to check their blood sugar level. A premature baby's immune system is also still developing, so they may be more likely to get infections than a term baby. Feeding a premature baby breast milk is the best way of boosting their immunity and protecting them from infections. Another problem can happen because their digestive system isn't fully developed. A condition called necrotising enterocolitis (nek-ro-ti-zing en-tear-o-kol-i-tis) can badly damage the lining of their intestines. The best way to protect premature babies from this is to feed them breast milk. 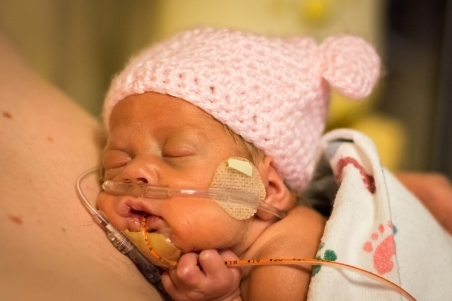 Premature babies have very thin-walled blood vessels, which can cause bleeding in their brain. This is called an intraventricular (in-tra-ven-trik-u-lar) brain haemorrhage. Sometimes this is minor and doesn't cause any long-term damage, but sometimes it can cause serious brain damage. Premature babies are also more likely than term babies to get jaundice. 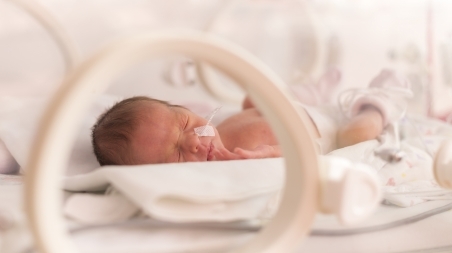 What long-term problems can premature babies have? The more premature a baby is the more likely they are to have long-term problems. Some who are born close to term have no long-term problems at all, while others can have several problems. Having a premature baby can be an emotional roller coaster. Your new baby is in the neonatal unit, in an incubator, attached to machinery. This is probably not what you imagined your first days together would be like. You may even find it harder to bond because your baby is not in your arms. The neonatal unit staff are there to help you through this time. They can keep you informed about how your baby is being cared for and provide emotional support for you and your family. Your midwife or LMC will also provide postnatal care and support for four to six weeks after your baby is born. You can get support from the Neonatal Trust, a charity that operates throughout New Zealand. It offers support while your baby is still in NICU, support at home, playgroups for babies, and more. The Canterbury Neonatal Unit Trust Fund is a locally operated trust. It supports staff and families of all babies that go through the Christchurch Women’s Neonatal Unit.